I’m not saying I’m completely gullible, but my smokin’ hot wife, Kay, might disagree with you. I wanted there to be life on Mars and when I found what I thought was such an announcement about it, I was very excited. Kay quickly set me straight. As normal humans is we ALL have personal beliefs and perspectives about the world. And, naturally, we look for evidence to support those beliefs. The problem occurs when we ONLY accept “evidence” that supports our views and automatically reject those that don’t, regardless of the source. Guess what. That happens to marketers all the time, especially when it comes to measuring ROI from our efforts. Bottom line, there is only ONE measurement of marketing ROI. 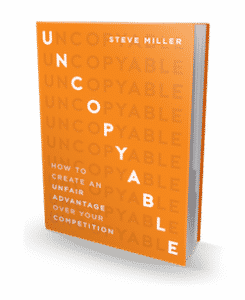 Watch this week’s UNCOPYABLE Business episode #127 and listen to what Steve has to say about it. I think Google and Facebook would have huge problems making money if people cared to bother to measure ROI. It bothers me that yellow pages and other agencies sell adwords and FB ads to clients and don’t measure conversions.